It was an idea that encapsulates the genius of Pina Bausch: and, as with all great innovators, her brainwave was a spark so simply ignited, yet one that has blazed into an enduring flame. 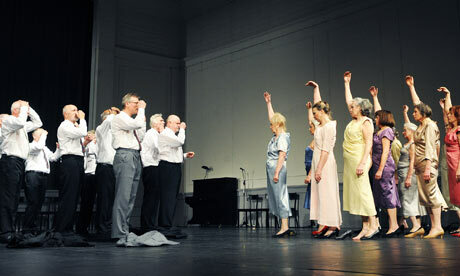 In the final year of the last Millennium, Bausch took a work she had made in 1978 (the same year that ’Café Müller’ came to be) and decided to turn it into a one-off performance by ”Ladies and Gentlemen over 65”. She had realised the extra potential of ’Kontakthof’ being enriched by performers with more life experience and decided to recruit ordinary people from around her base in Wuppertal, who would have no prior professional acting or dancing experience. It wasn’t the easiest idea to translate to a paying audience: Bausch intended to bring the project to the stage in just three months, but it took a year beyond this initial estimate. The senior citizens – selected through a lengthy audition process (the oldest then being 72) – were shocked to discover that the professional ensemble of Tanztheater Wuppertal were to perform ’Kontakthof’ a week before their own ”event”. They felt certain that their amateurishness would be exposed and that they would look fools when compared to the professionals. It transpired altogether differently and many full company members decided immediately that the roles were no longer theirs. From then on, ’Kontakthof’ belonged to the oldies. As performed by the seniors, ’Kontakthof’ is a charming and life-affirming experience. The emotions that Bausch intended for the work – desire, disappointment, desperation, tenderness, vulnerability, showing oneself, overcoming oneself – are all the more emphatic when enmeshed in the rich experience of the seniors’ interpretation. But, above all this is the thought that the players themselves have had another chance at life. To be over 65 and then to have the opportunity of experiencing the exhilarating career of a performer is something remarkable: even more so, given that this new life for some has already lasted many years. They say that ”Life begins at 40”; in Wuppertal, it begins again at 65. One of the crucial elements of the piece was my fascination with the people who were the performers. Who were they? What was their life like? Why were they performing this piece? How had they got involved? They were performers performing intense choreography but at the same time they we not performing, they were being themselves. Written by ALAN LYDDIARD in Community Arts International.